Sam had an obvious genetic advantage: muscles. And didn't share Prince Caspian's hairdresser. At least we were on the same team. By now you’d know that when I was young I was pretty fast around the track. I’ve talked about my skills here on MK Tales at length, it’s been in the news, and generally passed down from one grandmother to the next in villages everywhere as legend and heartfelt tales of yore. My friend Sam & I dreamed of one day representing our respective countries at the Olympics. Our source of motivation back then was the film Chariots of Fire. It featured lots of skinny white people in tiny shorts, so I could relate. Even if you haven’t seen the film, you’ve heard the theme music, which was written by The Little Mermaid, Snow White and the company that makes those motivational posters, to uplift listeners to realms of previously unimaginable inspiration. Even the guy in the video clip, who smokes like a chimney, WHILE he plays the piano, probably won a gold medal in something inspiring. Beard growing perhaps. It was enough to make the deaf walk and the lame see. In the opening scene of the movie I’m pretty sure flowers spring up around them as they run, puppies play in the sand and there’s a peace accord written in the Middle East. In the first 5 minutes. This cinematic swansong was about Christian runner Eric Liddell, who wouldn’t run on Sundays because of his beliefs. He became our hero, although, quite humbly, I must maintain that I soon surpassed his piety; extending my sabbath to cover all seven days of the week and doing very little with my time other than watching Chariots of Fire for the 1050th viewing. I was fully aware that all that watching and humming along would undoubtedly make me faster on the track. In the movie they always ran in slow motion. I figured this was because it was set many many years ago, before humans were as as fast as they are today. Running in slow motion always felt counter productive to me, but since they all did it, it was still a fair race, and kept much of the excitement intact. To be fair, running fast with that music blaring in your ears the whole time, inspiring as it was, would have been quite difficult. Sam & I had no such luxuries like training on English Beaches (I know, the term is somewhat of a misnomer) or through the courtyards of Oxford. We had a lumpy, dry track that cornered so tight you could blow a knee out or stab someone in the eye with your elbows. The thick lane lines were drawn with pounds and pounds of builders plaster, which would inevitably get all over your hands and in your eyes. Then we hit the Jackpot: The Bolivarianos came to town. The Bolivarianos were not a Mariachi band, as you’d expect, but a sort of mini-olympics, with only nations that had been ‘set free’ by Simon Bolivar allowed to take part. This narrowed the field somewhat, to most of the South American nations, and perhaps France. If you’d like to know more about famous Spanish General Simón Bolivar, I don’t care. I guess he did get a small country named after him though, which is no small feat. His namesake games don’t have a website from what I can tell, although Google did give me some interesting information about hard how pregnancy is for Dads. All that hand-squeezing and such. 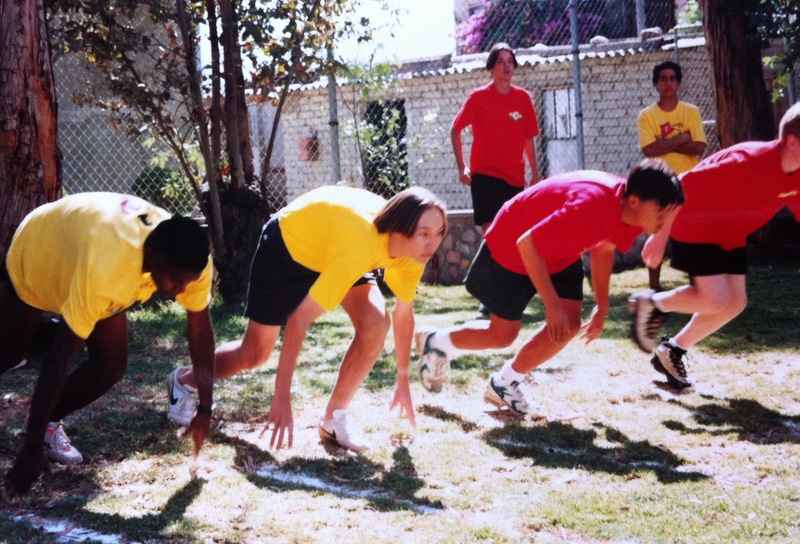 Anyway, Cochabamba hosted the Bolivarianos one year and had to upgrade all their woefully inadequate sporting arenas which meant we had a brand-new running track to make dreams on. OK, it had nothing to do with us, but it gave the city a new-found interest in Athletics so we jumped on board. It was all the way in the middle of the city, so Sam’s older sister Gloria would take us in by bus every afternoon. Most days we didn’t take enough change with us for a bus the whole way home, so we walked about 15 miles from the stadium back to the main highway and caught the bus from there. By then everyone was in a foul mood and hated athletics and were looking for shortcuts like stealing more money from Mum and Dad. Or steroids. That’s how it starts. I wasn’t much good by that age anyway, since all of my peers had hit puberty several years before while I was still up late every night luring my chest hairs out with tweezers fertilizer. Although, even if everyone else was faster than I was, it was nice running on a rubber asphalt track, if you ignored the smell of excreta wafting out of every exit hall in the place. Even if there were no discernible loaves hiding in the shadows of the halls and ticketing areas, the whole place still stank like my brother’s room after he contracted chicken pox that one time and mum and dad locked him in for a week. But when you ignored the smell it felt so free to be running on a track with your spike shoes on, finally useful after years of clambering through tussock. Sam went on to athletics city finals of some sort I think, in the hurdles, which neither of us had ever done before, since it would have resulted in certain and instantaneous death on the school track. I have no clue what Gloria ever did on those afternoons. I think she just went along to the stadium every day to look at boys. It was a great running track, and considering how much you’d pay to use facilities like that in other countries, (in some places there are actually tiny rooms reserved for doing twosies. weird…) I guess we were pretty spoiled. Posted in Bolivia, CharactersTagged Bolivarianos, carachipampa, Chariots of Fire, cochabambaBookmark the permalink. Hard to read through the tears!